Archaeologists have revealed the remains of what they say was a “high status” woman of Moorish origin who lived in York during Roman times. The fascinating study was carried out by the University of Reading’s Department of Archaeology, and senior lecturer Dr Hella Eckhardt said: ‘Up until now we have had to rely on evidence of such foreigners in Roman Britain from inscriptions. ‘However, by analysing the facial features of the Ivory Bangle Lady and measuring her skull, analysing the chemical signature of the food and drink she consumed, and analysing evidence from the burial site we are now able to establish a clear profile of her ancestry and social status. ‘We’re looking at a population mix which is much closer to contemporary Britain than previous historians had suspected. 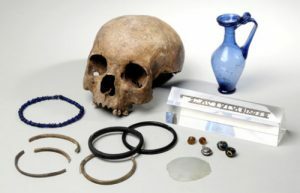 ‘In the case of York, the Roman population may have had more diverse origins than the city has now. ‘This skull is particularly interesting, because the stone sarcophagus she was buried in, and the richness of the grave goods, means she was a very wealthy woman, absolutely from the top end of York society. ‘Her case contradicts assumptions that may derive from more recent historical experience, namely that immigrants are low status and male, and that African individuals are likely to have been slaves. ‘Instead, it is clear that both women and children moved across the Empire, often associated with the military.’ The research is published in the March edition of the journal Antiquity. 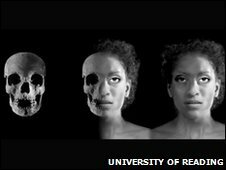 The research used modern forensic ancestry assessment to show it was likely she was of North African descent and may have migrated to York from somewhere warmer. The ‘Ivory Bangle Lady’ and he possessions will be the centerpiece of a new exhibition at the Museum in August entitled ‘Roman York: Meet the People Of The Empire’. York, known as Eboracum during Roman Times, was a legendary fortress and civilian settlement which was visited by a string of emperors. 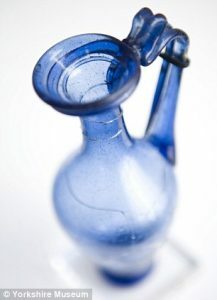 The experts believe these factors provided reasons for potential immigration to the area and for the foundation of a multi-cultural community.An exquisite pristine blue glass jar that was uncovered A new GCSE history course, said to teach students that Africans arrived in Britain before the English, has caused uproar among some British academics. The module, which will be offered by the Oxford and Cambridge examination board (OCR) from September, was created with academics from the Black and Asian Studies Association. It will cover new arrivals to the UK from the Romans up to modern day migrants such as those from Syria and eastern Europe and assess the reasons for immigration, the experience of new entrants and the impact on the indigenous population. A book on the course reading list, written by a Marxist historian, is said to refer to a Roman legion of North Africans briefly stationed on Hadrian’s Wall in the 3rd Century, before the arrival of Anglo-Saxons. But the newspaper states that while up to 500 “Aurelian” Moors – named in honour of Emperor Marcus Aurelius – manned a fort near Carlisle, there is no evidence they settled there.